We use the newly formulated three-dimensional (3-D) kinematical conservation laws (KCL) to study the propagation of a nonlinear wavefront in a polytropic gas in a uniform state at rest. The 3-D KCL forms an under-determined system of six conservation laws with three involutive constraints, to which we add the energy conservation equation of a weakly nonlinear ray theory. The resulting system of seven conservation laws is only weakly hyperbolic and therefore poses a real challenge in the numerical approximation. 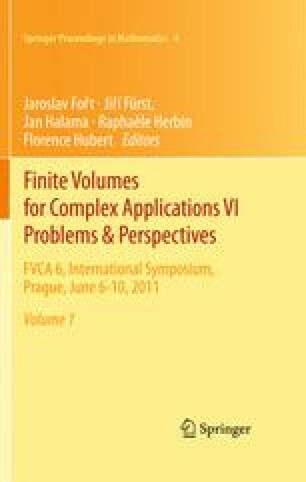 We implement a central finite volume scheme with a constrained transport technique for the numerical solution of the system of conservation laws. The results of a numerical experiment is presented, which reveals some interesting geometrical features of a nonlinear wavefront. K. R. A. wishes to thank the Alexander von Humboldt Foundation for a postdoctoral fellowship. P. P. is supported by the Department of Atomic Energy, Government of India, under Raja-Ramanna Fellowship Scheme.